The second live-action film adaptation of the popular sports manga series was screened at Eiga Sai: Japanese Film Festival in 2012. Terrestrial broadcaster GMA Network has announced in a television advertisement on Wednesday that the 2011 live-action film adaptation of Ashita no Joe will air on GMA News TV this Saturday. The film will have its television premiere on the news channel’s “Reel Action Sabado” movie block on Saturday, August 4, at 03:00pm, which will air in Filipino dubbing. 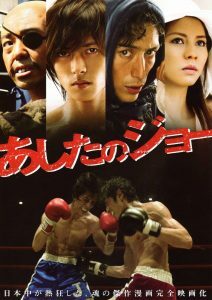 Ashita no Joe, also known by its English title “Tomorrow’s Joe”, is the second live-action film based on the sports manga series written by Ikki Kajiwara, under the pen name “Asao Takamori”, and illustrated by Tetsuya Chiba. The popular manga ran in Kodansha’s Weekly Shonen Magazine from 1968 to 1973, with a total of 20 volumes. The series was adapted into several animated film & television adaptations, and video games. The first live-action film adaptation was released in 1970, starring Shoji Ishibashi as “Joe”, Ryutaro Tatsumi as “Danpei”, and Seiichiro Kameishi as “Rikiishi”. Ashita no Joe’s 2011 live-action film was directed by Fumihiko Sori, who worked on the 2017 live-action film adaptation of Fullmetal Alchemist, while veteran scriptwriter Eriko Shinozaki handled the movie’s screenplay. The movie was released in Japanese cinemas on February 2011, which was produced by Tokyo Broadcasting System and distributed by Toho. Singer and actor Tomohisa Yamashita, who is the lead for the long-running drama series Code Blue, played the lead character “Joe Yabuki”, while actor Teruyuki Kagawa (“Takeda Kanryu”, Rurouni Kenshin live-action film) played Joe’s coach “Danpei Tange”, and Yusuke Iseya (“Morita”, Honey and Clover live-action film) as Joe’s rival “Toru Rikiishi”. The live-action film premiered in the Philippines for the first time as one of featured attraction of the popular Eiga Sai: Japanese Film Festival in 2012.